Hair in GR, we show made love for our curlfriends. A few Sundays ago, I had the pleasure of having brunch with an incredible group of ladies. It was a brunch held by the Women of Color Creatives (WOC Creatives). It was hosted by aestheticism and make-up artist, Janiece Hughuley, the owner Studio 824 Beauty Lounge. We weren’t meeting about a hair-related issue but I could help but to crush on everybody’s hair. I love when Sistah Queens get together to encourage one another and exchange resources. It’s such an affirming experience to come to a place filled with warm and welcoming curlfriends where there is no competition. We know that there is enough love and money in the world for all of us. This group gets together each week with a different hostess choosing the location. We talked about skin care and make up at this particular brunch. We shared ideas about what beauty services we’d like to try or workshops we’d like to attend. We talked about unity and improving the community. I met some fabulous ladies and look forward to hanging with them again. Last week Latarro Traylor, the creator of the Facebook group BPGR was the hostess. I hate I wasn’t able to attend. 😌 I know the discussion was on point. I’m going to try to attend the brunches every other week. On August 4, I had the pleasure of conversing with a group of amazing Sistah Queens about our natural hair. I am always amazed by the number of people who don’t feel confident or competent to wear their natural hair. That’s why I’m so thankful for events like Textures & Tea – A Candid Conversation About Hair & Beauty. 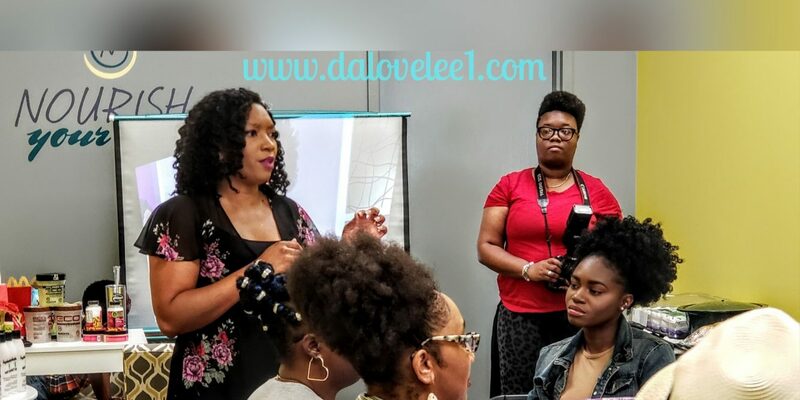 The event was hosted by three local natural hair enthusiasts Aleka Thrash (Naturally ACT), Kayon Crosby (Nourish Your Curls), and Melissa Albury (Shead, LLC) and was held at Nourish Your Curls. The cost was $22 (earlybirds paid $20) and it was well-worth it. There was delicious food, candid discussions about hair, giveaways, a product exchange a product drive for teenaged girls who have aged out of foster care, and an opportunity to purchase items from the boutique. This cake melted in my mouth but it was almost too cute to cut. Aleka lead us in an activity where we were able to identify our hair goals for this year. That was hard for me. I’m comfortable rocking my TWA and have a great routine with products I love. Other ladies were struggling with their hair journey. Aleka gave us an opportunity to ask questions and give each other tips and encouragement. Everyone was at a different place in their hair journey so a wide variety of topics were covered. Transitioning styles, hair-pressure in the workplace and community , teaching youth to embrace their hair, and the impact medication, diet and exercise has on your hair/skin were a few of the topics broached in that short amount of time. Melissa shared how her husband helped her discover that her mother had a great product and now has a family business venture called Shead LLC. She told us about her personal hair story and commanded us to own who we are. Almost everyone in the room agreed that we have never been taught to love, let alone manage, our natural hair. The pressure to conform to societal norms starts early and is hard to resist, even as adults. We encouraged each other to come to accept and love our hair textures and to work with what we got. We can’t idolize another person’s tresses because we will only be disappointed when we can’t immolate their look. Each of u shas our own unique beauty and so does our hair. Make sure you try out Shead products. Kayon educated us on the importance of knowing the porosity of our hair when choosing products to moisturize and style our hair. She explained how to identify your porosity (click here to read a post I wrote porosity) and the benefits of using heat with deep conditioners to retain moisture with low porosity hair. She also shared that she finds the LCO method is more effective for her hair than LOC. I was geeked because I definitely could relate. My hair story was a hot mess until I learned about my hair’s porosity. It was great information for new naturals and a great reminder for those who transitioned a while ago. One of my favorite hair product lines, The Mane Choice is presenting the 2018 Detroit Natural Hair Expo at the Cobo Center! This will be the biggest natural hair meetup in Michigan. There will be over 50 vendors including my other fav line Uncle Funky’s Daughter. Ooohhh, product junkies hair is where you want to be. Bring those duckets and get together with your curlfriends. You will leave feeling fabulous and unified. Don’t miss out. Oh yeah, did I mention the first 100 people to arrive get a swag bag. On the other side of the state, the Creston Brewery, Grand Rapids’ one and only black-owned beer brewery, is hosting it’s 2nd Anniversary Extravaganza. It’s a street party featuring some of Creston’s best brews. There will be live music by local artists Ty Beat and Grand Rapids Soul Club. It’s going down from 12 PM until 11 PM. The Creston Brewery is located at 1504 Plainfield Ave. NE in Grand Rapids. I know those curls will be popping. I wonder what a hair-rinse with Creston’s beer will do for our naturals? Hmmm. Night of Couture & Culture is a fashion show is supporting Arbor Circle and Pan-African Millennials. It will feature local brands and artists like Delasie, MelX Fashion. The Kyra Danaya Collection and Bel Ren Couture Clothing. The feedback from last year’s show was spectacular. My homegirl Deb from the Deb Williams Agency will be strutting down the runway, along with several other fashionistas. It’s taking place at the Goei Center on Butterworth. Tickets are $25. Movies on Monroe is presenting the two best superhero movies that will make you proud to be black and/or proud to be a woman. I’m talking about Black Panther and Wonder Woman. That’s right. Both movies are playing back to back in the same place on the sametime, 555 Monroe Ave NW in downtown Grand Rapids. Pre-event festivities start at 6:30 and include local performances, face-painting, a chance to win $50 by simply taking a survey and a superhero contest for adults, kids, and dogs. Let me go get a Wakanda fade… just playing hubby. 😁 Admission is free. Bring those lawn chairs, blankets and bug sprayto be comfortable..
Do you want to celebrate living a healthy lifestyle in the black community? It will make your hair long and strong. Come down to MLK Park in GR for Rhythm and Sole? The Grand Rapids African American Health Institute (GRAAHI) iand Urban Core is having a fair to celebrate getting fit. Community organizations and local businesses will have booths to share services and products they can provide to create a healthier community. There will be a 5K, blood pressure testing and much more. It starts bright and early at 8 AM. Stop by my agency’s (Wellspring Lutheran Services) booth to learn about issues affecting African American children in child welfare, a social determinant of a communities health of Kent County. Finally, We Are Lit GR and Toresa M. Blakely created a book 📖 club for Sistah Queens in GR called Women Who Read GR. We are currently reading Better Late Than Never by Kimberla Lawson Roby. We will meet to have an in depth discussion on the book at 900 Muskegon Ave NW at 6 PM. Kendra McNeal, owner of We Are Lit, held a few give-a-ways for the group. I won a free book by the same author just for ordering my book through her website. That’s some of the perks of supporting local businesses… and like Amazon, both of my books were delivered to my doorstep. 🙌 This is the first book but I know they’ll be more. Git up on it. What are you and your #curlfriends doing? I want to know what else is going on around Hair. If you know of other events that I should share let me know. I can’t attend them all but I’ll definitely try. Next Post New Podcast Alert: I Don’t Care If You Listen!! !